Writing to, from and down the bones sounds simple enough–the detail, the divine detail–but the word fount must be vast and strong. Specificity takes knowing the names of things, everything. I can hardly remember my own. Names. I lack an honest pen. I am just learning to live with things as they are, not according to my vision and story, but as they are. I’ve embellished on life, added color, flexed the edges of pathways and tables to make them fit a certain slant in my sight. It sounds like fabricating–lying–but I think it’s appropriate to call it crafting. Yes, there is a line, a circle too. But crafting is legitimate, carving stories from wood and steel. I do it. We all do. Ultimately we are the stories we write ourselves into from everything we deem real, lived and experienced. There is a rolled up tube, wide and tall as my thigh, slightly taller, that stays tubed by a rubber band, awaiting a frame as it sits vertically atop my desk, white, serene, divided in half by that serpentine rubber band. Inside, I have seen the cow skull atop the man, sitting in the foreground with powerful arms and lean body, brown man in the heat, in the background a rustic desert cafe one sees in dusty towns off long, leaning highways into the horizon. He wears a skull as ritual, in his town, an African town, somewhere outside Johannesburg. The line sketch print, presented to me as a birthday present, one I asked for after spying this piece at a friend’s house art gallery opening, pleased me softly and widely. 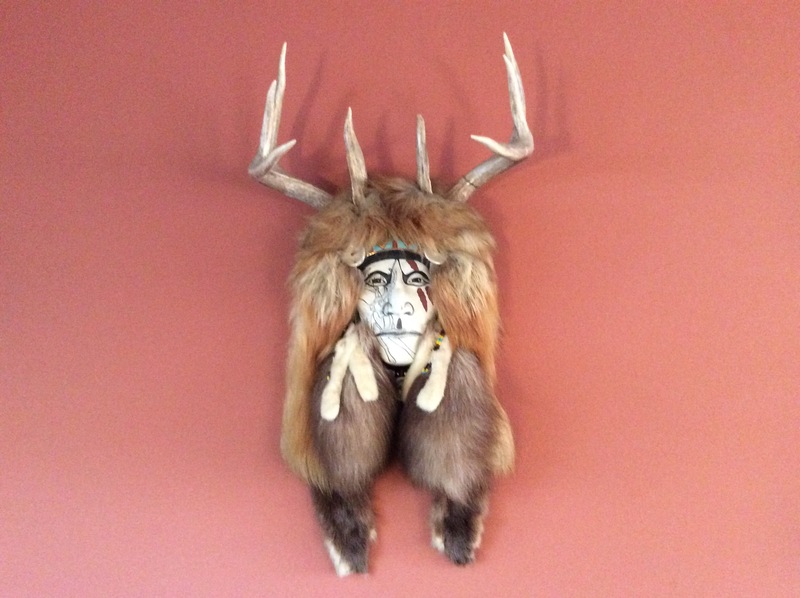 Perhaps the cow bones spoke the truth in human animality, like the Native American mask that hangs above the fire place: antlers, fox skins and painted man. They came to be as someone’s vision. My husband bought both pieces for me, witnessing the missives sent without reading them. Perception. Vision. That is my story, my detail of notice and narration, memory and matters.